Just a short update . . . 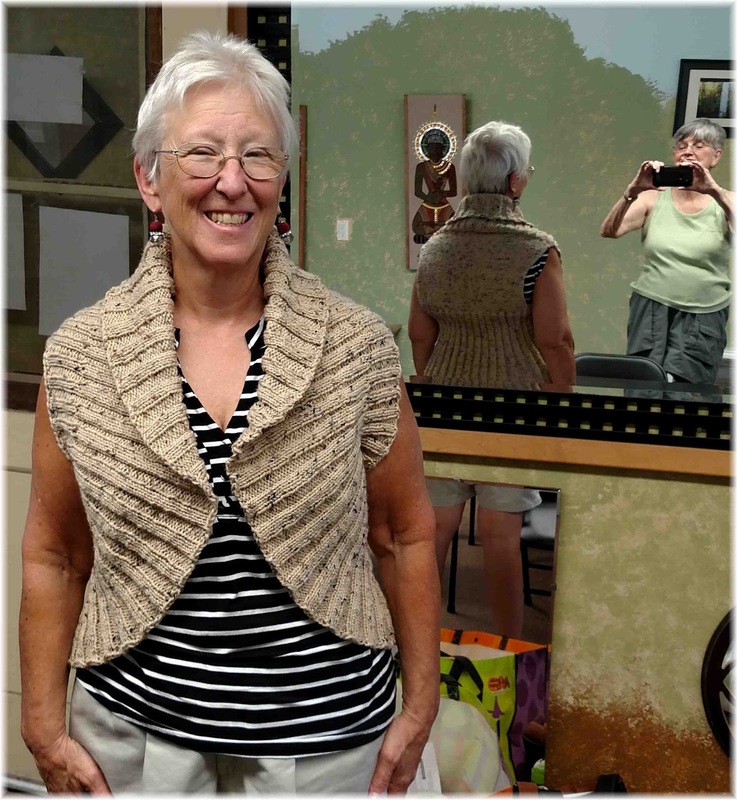 The ladies at NeedleCrafts have been knitting and crocheting up a storm all summer, in prep for Fall craft fairs in our little town. They've tried to set up a few fairs on not-the-regular dates, and coordinating the scheduling and venues got too complex. So I think I heard them say today that they'd be setting up on Friday and Saturday after Thanksgiving. If I'm wrong, I'll tell you later. That is a ways off. I think I've included some of their work in regular blog posts, but I'll just show a few of the things that came in today. This first one is not for sale. Barbara has been making this shrug for herself and finished it up this week. You can sort of see the back in the mirror (and I left myself in the mirror, too). Click it to enlarge to note all the spiffy detail in the back. It creates a nicely defined waistline, although I don't think there's anything that would define my waistline. It will be a cozy winter warm-me-up. I won't be surprised to see several more under construction. 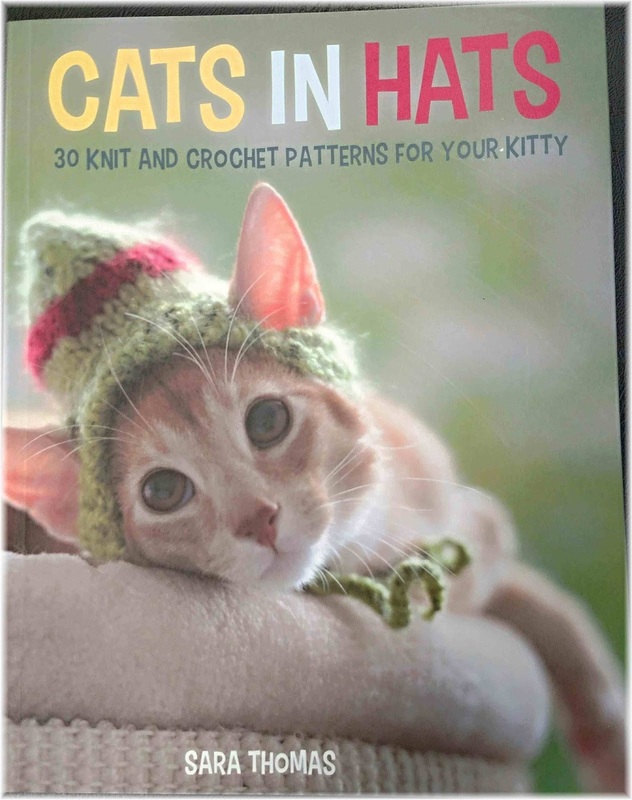 Barbara brought in this book on how to knit or crochet hats for your cats. Sorry for the fuzzy picture. It's reflection off the book cover that I didn't see until I opened the pic here. The kitties in their hats are adorable. "What cat will let someone put a hat on it? Mine wouldn't." "Mine neither. But when my grand kids were little, they had a kitty they dressed up all the time and she was very cool with it." "We can make some for the craft fair." "No cat will let anyone put a hat on it. Mine wouldn't." "Maybe kittens that grow up with little kids are more tolerant of being dressed up." "My cat would never let anybody put a hat on it." "Hey. Some of these would fit an 18" doll. We can make them for dolls." "We'll have to leave the ear holes off." 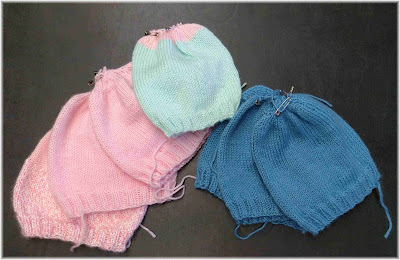 Was it Judy It was Liz who brought in all these little hats for infants.? These little ones often get donated to the nurseries at the hospitals or at women's shelters. More from Barbara. 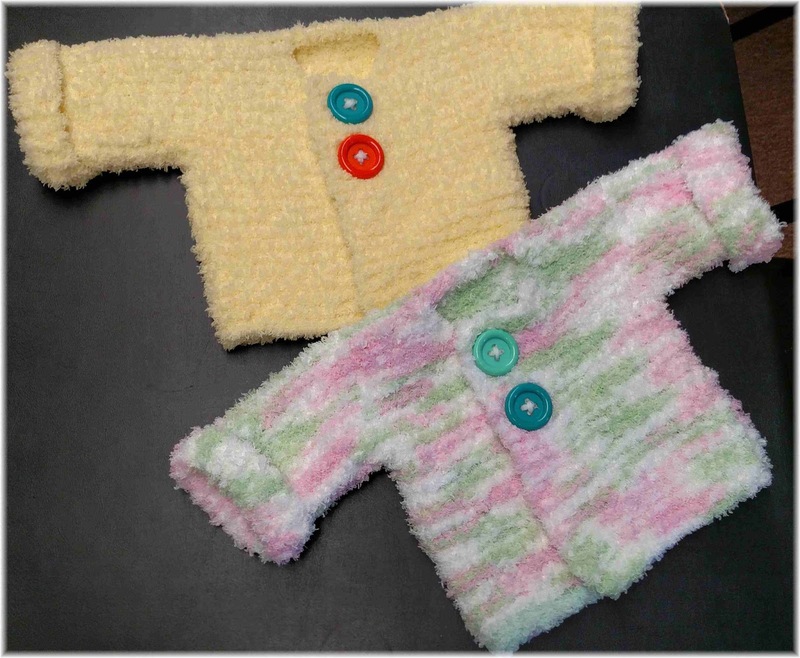 These little baby sweaters are as soft as baby bunnies. (I'm not sure I've ever patted a baby bunny, but it's how I imagine.) She has another one underway. We had 12 needlecrafters here today, and a couple of ladies who dropped by to check us out. I got too absorbed in my project to wander around capturing what everyone was doing. There is an amazing variety. I'll try to remember next week.